Robin Trower is a good illustration for the debate on why classic rock artist maintain their staying power. 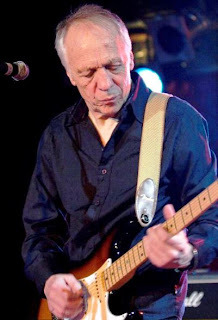 Since joining Procol Harum (“Whiter Shade of Pale”) in 1967 and then forming the Robin Trower band in 1973, Trower has released twenty nine albums and continues to tour worldwide. He doesn’t worry if his songs will be played on the radio and won’t worry about the music industry, he just likes playing music. So many classic rock artists are reluctant to reveal a spiritual side. They prefer to keep their views agnostic. I applaud Trower for breaking tradition. It may be one of the reasons why he’s been around so long. Referring to his freedom to musically create what he wants. In the early 1980’s, Trower collaborated with Cream bassist Jack Bruce, releasing two more albums. In 2007 he released a third album with Bruce, and in 2009 added a fourth called, Seven Moons Live recorded in Nijmejen, Holland. Trower has also produced several Bryan Ferry (Roxy Music) albums. Robin Trower continues to rock with a brand new CD called, Playful Heart and the return of the power- trio. Robin Trower will be performing live in concert on Saturday, January 29th at 8pm at the new Jannus Live in St. Petersburg. It’s a great chance to watch one of classic rocks legendary guitarist at Tampa Bay’s best small concert venue. Contact me at rockraymond.shasho@gmail.com to share your classic rock stories or provide suggestions.